Homemade scrambled eggs are a bit part of our morning routine. My growing toddlers demolish an impressive quantity of eggs, sometimes eating 6 to 8 eggs each in the morning. Some days this short order cook mama can hardly keep up. 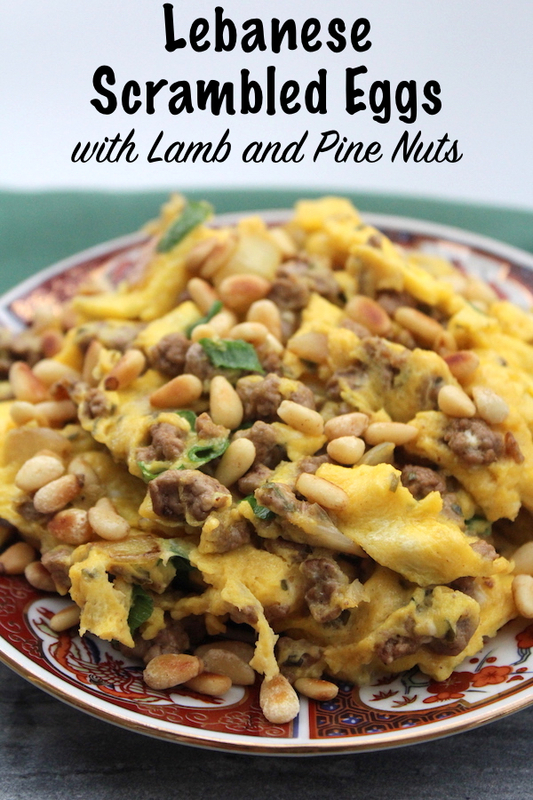 I’ve been looking for ways to branch out from plain scrambled eggs in the morning, and I ran across this recipe for scrambled eggs with lamb and pine nuts in The Lebanese Kitchen. Thus far everything I’ve made from this cookbook has been amazing, so I decided to try this Lebanese breakfast twist. Start by browning ground lamb with a bit of minced onion and spices. Scrambled the eggs and get them started cooking in a skillet for a minute or so before adding in the lamb. 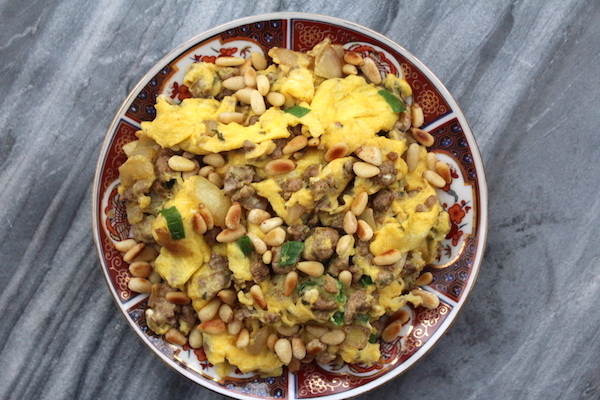 Once the eggs and lamb are finished cooking, the breakfast is topped off with dry toasted pine nuts. I know, nuts in scrambled eggs…really? Yup. It’s really good, and pine nuts are the perfect addition to add a bit of toasty warmth and crunch to breakfast. Instead of making this as scrambled eggs, you can also make it as a breakfast egg bake or frittata. We generally make eggs in a small 8” cast iron pan, which is perfect for transferring to the oven for a quick baked frittata. If you’re going to use that option, simply brown the meat and onion in the pan with the spices, then pour eggs over the top before putting the whole thing in the oven for about 8 minutes. 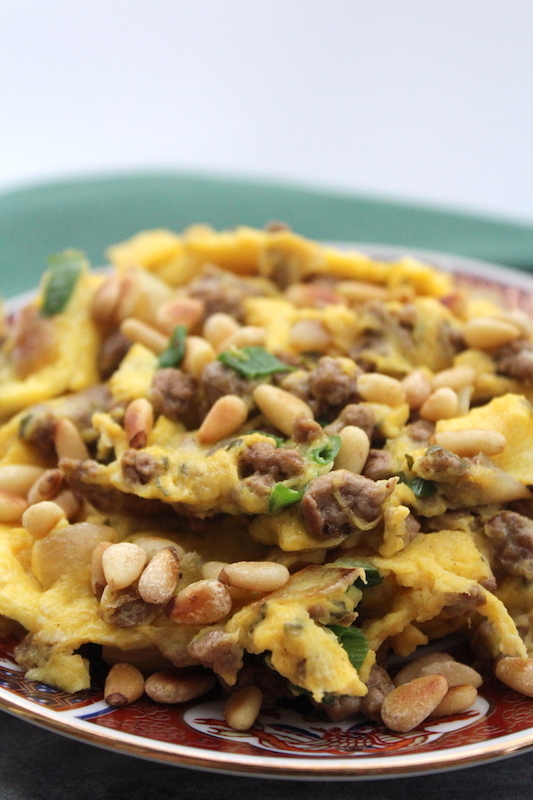 This savory Lebanese twist on breakfast will help you rethink possibilities when cooking with eggs. Add the olive oil and onion into a small skillet (an 8'' cast iron works well). Cook the onion until softened, about 5 minutes. Add the ground lamb, along with garlic and spices (and salt to taste). Cook on high heat until thoroughly browned and cooked through. Pour in beaten eggs, and either continue to cook on the stovetop as scrambled eggs, or place in the oven and bake at 400 for about 8 minutes for a frittata. Top with pine nuts that have been dry toasted for 1-2 minutes in a hot pan with no oil. Seven spices seasoning is a blend of black pepper, paprika, cumin, coriander, cloves, nutmeg, cinnamon, and cardamom. A small pinch of each works well as a substitute. This recipe can be made in the oven as a frittata, just brown the onions, meat, and spices, then add the beaten eggs and bake at 400 degrees for about 8 minutes.